What’s the secret to health and happiness? Your relationships. In fact, strong bonds with others have been found to be a better predictor of a long, happy life than money, IQ, genetics, or any other factor. But what if your kid struggles to make friends? Okay, you can’t make friends for them. But you can help your child learn to get better at it themselves. First of all, if your kid isn’t lonely, don’t worry. As long as they have at least one friend, they’re probably fine. What if your child tells you they’re lonely? Take a deep breath. You don’t want to let your kid know you’re anxious about it -- that only puts more pressure on them. More than anything, they need someone to just hear them and acknowledge their feelings. Ask your child’s teacher if your child plays with other kids at school. They may be able to suggest other kids for play dates. And if you suspect there could be an underlying issue, their teacher is a good place to start. Give your kid opportunities to meet other kids. Go to the playground. Take them to community or religious events. Sign them up for preschool or activities like sports or a music class. Encourage activities they’re good at to build their confidence and give them exposure to kids they’ll have something in common with. Play with your child yourself. Show them what being friendly looks like. Don’t boss them or criticize; instead, be open to their ideas, share, show interest in what they’re doing, and smile and laugh often. Invite over other parents with kids your child’s age or a bit younger (younger kids may be more developmentally on par with your child and feel less intimidating). You may also want to focus on families who live in your neighborhood -- it’s easier to hang out and build a bond with the kid down the street than with a kid across town. Set up play dates for success. Support whatever friendships your kid does have by helping a play date go well: Host it at your house, where they’ll probably feel more comfortable, and make it one on one, since having even two pals over can feel intimidating. Limit it to one or two hours so it’s more likely to end on a positive note, and set out noncompetitive, nonaggressive games and toys (in other words, skip the video games and pretend weapons) you know your child likes and feels comfortable sharing. Once the other child arrives, step back and try not to interfere. Afterward, praise your child for what you noticed they did well, and let natural consequences take care of the rest. Practice positive social skills with your kids (without them even realizing it!) by singing along to the playlist for Q Wunder! If back-to-school feels like back-to-stress for your family, hey, right there with you. Fortunately, there’s no need to fret when you can live and learn from our 11 top-of-the-class tips instead. After more family time over the summer -- on vacations, staying up late with you – it can be tough for kids to go back to not seeing you as much. Earmark special time with them daily (even if it’s only five minutes!). Give your child a chance to recharge by putting them to bed on time, offering them healthy choices at meals, and getting them outside to play every day. Plan play dates with school friends. Seeing buddies from school after hours strengthens those friendships and makes kids look forward to even more fun together back at school. Kids love to know what to expect. Create a daily schedule of what they’ll be doing: What time will they go to school? When will you pick them up? What will they be doing after school? What time will they go to bed? Then post it somewhere they can see it. Get your morning routine down. Have your child lay out their clothes and pack their backpack with lunch, snack, and any supplies the night before. And post a morning routine chart to help the next day go more smoothly. Finally, leave extra time to get to school a little early -- the last thing you need is added stress over being late. Figure out your goodbye ritual. Whether it’s making up a secret handshake or coming up with your own just-between-you saying, having a farewell ritual makes drop-off special -- and gives both you and your child a clear signal that it’s time to part ways for a while. Do your homework while they do theirs. The return to homework can be stressful for some kids. When your kid pulls out the worksheets, sit down with them and pay bills, plan a presentation for an upcoming meeting, whatever -- working together makes it more fun. The teacher may have some helpful intel about what’s going on at school. Or they may not realize your kid is struggling and can start giving your kiddo the extra attention they need at school right now. Either way, you want them on your team. Letting your child know they’ll see you later at school makes morning goodbyes easier. Let them bring something from home along. Take a photo of the family -- plus one of their lovey if you’re worried it might get lost at school – and put it in their cubby. You can even tuck your pillowcase or one of your T-shirts in their backpack; the sight and smell of something of yours will feel comforting when you’re not around. The Q-Time Buddy is a soft, weighted stuffed animal that can help your kid build focus and attention with a gentle breathing exercise. Try it first thing in the morning to help your kid de-stress and set the tone for their day! Butterflies over starting school? Hey, that’s perfectly normal--and not just for the kids. Fortunately, if your little one’s headed to kindergarten this fall, we’ve got a little homework for you to ensure it’s an A+ experience. Read a book about starting school. Buy a book or get one from the library about the first day of kindergarten. Knowing what to expect helps kids feel more comfortable with the transition. Bonus: Reading to your child also helps them build comprehension skills--and learn to enjoy learning. Visit your child’s school before the first day. Most schools hold an open house before school begins, which is a great opportunity for your child to meet their teacher and other kids in the class. Travel the route your child will take every day to get there and spend some time in their classroom if you can. Tell them when their day will start and when you’ll pick them up. Arrange a play date with other kids in your child’s class. Whether you get invited to a group play date by a class rep or meet other families at an open house, try to get together (at a park near the school, say) at least once before the first day. If your kid’s been going to bed later over the summer, start dialing that back by 15 minutes every night until you get to their target bedtime. You’ll probably want to aim for around 7:30 or 8:00; check our bedtime chart to see what’s right for your kid. It’s fine if your kid can’t tie their shoes yet, but you do want to ensure they can zip and unzip their backpacks and coats and get their shoes and coats on and off on their own. You’ll also want to make sure they can get their lunch containers and water bottle open without your help. Incorporate letters, numbers, colors and shapes into games. Play the alphabet game next time you’re in the car. Sing fun songs together like “Ten Little Monkeys.” Play I Spy with colors (“I spy something green….”) See how fast your child can sort silverware into the drawer. Make it fun and don’t push it; it’s more important that your kid enjoy learning than that they know how to count to 100. You don’t have to go overboard with a flashy first-day outfit or fancy backpack--even a colorful new set of pencils can help your child look forward to their first day. Ask your child how they’re feeling about starting school. If they’re excited, great. If they’re scared, explain that you were nervous about your first day of kindergarten too. But let them know that you also met new friends, learned cool new things and had fun on the playground. Keep calm and smile on. Sometimes parents have a harder time on the first day of school than kids do! But even if you’re secretly worried on the inside, try to stay relaxed and confident on the outside; kids are very good at picking up on their parents’ cues, so keep yours calm and positive. Fostering your child’s emotional intelligence promotes school readiness and personal and professional success down the road--get your kid started today with Q Wunder! Think back to your own childhood: Aren’t many of your best memories summertime ones? Hey, you only get 18 summers with your kids. Make the most of this one before it’s gone with our end-of-summer bucket list. Summer is made for family bonding with board games like Q’s Race to the Top! Kids watch what you do, so make sure they see you sharing with others -- including them. When your spouse or child walks in the living room, for example, make a point of saying, “Here, I'll move over so I can share the couch with you!” Or next time you’re out to eat, offer to share your fries with the rest of the family. Help your kids develop social and emotional skills -- and have fun while they’re doing it -- with Q Wunder! What with Velcro and all, your kid could never learn to tie their shoes and still live in sneakers. And it’s tempting to just keep cleaning their rooms and making their snacks long after they could do it themselves; after all, there’s no muss and no fuss when you just do everything yourself. But ultimately, that’s not fair to you -- or them. Ironically, fostering your kid’s independence does require more short-term work on your part -- but it’s worth it when they grow into responsible grownups who can take care of themselves. Here’s how to raise an independent kid of your very own. Let your toddler play on their own in a child-proofed room while watching from a distance. When they get a little older, send them outside to run around in the yard solo. And older still? Let them walk to a friend’s house down the street. Ask them to get it themselves. Even toddlers can serve themselves at the dinner table and fetch their own toys from low shelves or a toy bin. And if your first grader wants some milk? Tell them to grab the carton out of the fridge. Learning to share or ride a bike isn’t easy, and it’s tempting to swoop in and save your kid from their troubles. But kids’ proudest moments come from overcoming adversity. Resist the urge to do it for them; instead, just be there to support them through the inevitable frustrations that happen along the way. When a conflict comes up, take turns coming up with a solution and checking in with each other about whether that idea works for both of you. That way, your child is involved in resolving the issue (and bonus: is more invested in a compromise) rather than just waiting for someone else to hand them the answer. Friends teach kids how to manage their own conflicts and build their own connections. Set up plenty of play dates, even with the friends who aren’t your favorites--they’ll learn from those kids too--and, as much as possible, let the two of them figure out what to play together (and what to do when they disagree). Boredom is a good thing, because bored kids become resourceful kids who figure things out for themselves. Don’t overschedule your child and you’ll find they come up with their own fun. For little ones, it might be which shirt to wear today, or whether to go to the park or the library. Bigger kids can help decide what summer camp they want to go to, or what you’ll make for dinner together. Grant them some controlled ways to practice leadership, whether it’s having them make up a dance routine you follow, or asking them to help find your gate at the airport on a trip. Love and show confidence in your kid. When children trust their parents and feel safe and supported, they explore and try new things -- and build independence in the process. Next: Help your child develop the social and behavioral skills that lead to lifelong success -- get your free trial of Q Wunder now! Moving can be exciting -- but it can also be stressful, especially for little ones along for the ride. Smooth your move with these seven tips to help your kids stay calm amidst the chaos. Pack large favorite toys at the last minute, keep small favorites out for the trip, and get a couple of new toys for the journey and the first day in your new place. Finally, cram in a little special time with your kids every day, even if it’s literally five minutes--this is when they may need it most. Celebrate your new home--and meet new neighborhood families in the process. Even if your kids can’t tell a tree pose from a stick of incense, they are born with a natural wonder and awareness that form the foundation of mindfulness. Here are five ways to help them cultivate focus and patience today -- for a more calm and peaceful tomorrow. Pay attention -- really pay attention -- around your kids. Okay, so we get that you can’t just stop multitasking as a parent or you’d never get it all done. But do you really need to check your phone while you push your kid on the swings? That’s where special time comes in -- it shows your kid what undivided attention looks like. Grab a handful of raisins and give one to each member of the family. Turn it over in your hand and feel all its wrinkles and notice the variation in its colors. See how it smells. Then slowly chew it, noticing the sound it makes and the flavor in your mouth. Ask your kids how this feels different from the way you usually eat. Channel your inner flight attendant. Even when there’s turbulence, you can model calm and security for your kids. As much as you want to make it all better as a parent, you don’t have to fix negative feelings -- and neither do your kids. Sometimes it’s just about acknowledging that things are rough right now, but you can ride it out together. Um, your kids may be better mindfulness teachers than you are. Whenever you can, stop and listen to your kid who wants to show you a caterpillar cross the sidewalk. Next: Lay the Q-Time Buddy or another favorite stuffed animal on your kid’s belly and practice slowing down with deep breaths. A little quiet time helps little ones – and big people! – learn to focus, pause and chillax. We can’t stop eating these! But that’s a good thing. Here’s the recipe for a delicious brain-boosting snack for you and your kids, courtesy of our friend Becca Jansen, author of The Art of the Wholesome Breakfast and Artful Palate blogger. Boasting high-quality nutrition, these nearly raw, easy-to-make energy snacks are a hit at our house! 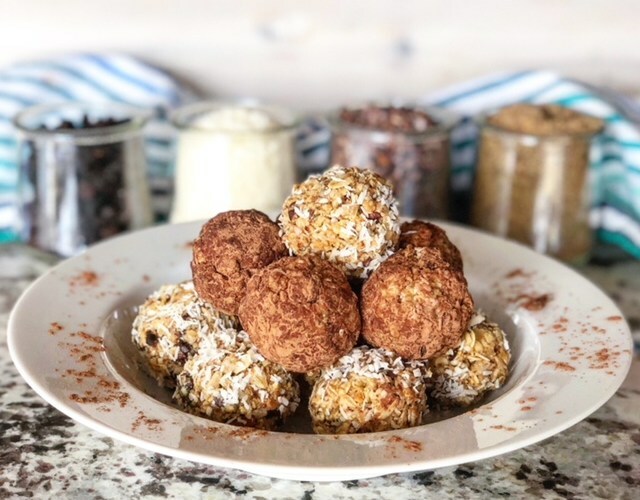 This recipe lends itself to a variety of dried fruit, seed, and nut combinations, and these energy balls are significantly healthier than your typical store-bought granola bar. They are also quite simple to prepare, and my kids especially enjoy making them (with a little help). I realize the importance of having healthy snacking options readily available so we are less likely to grab a convenient, less nutritious, packaged and processed snack. When assessing foods for brain health, we look for those high in antioxidants, healthy fats, and vitamins and minerals. Nuts and seeds are loaded with beneficial nutrients. Not to mention, they also add incredible taste and texture. Healthy, monounsaturated fats, found in nuts and seeds, are essential for brain health. The healthy fats we consume encourage ketosis, which assists in protecting the brain against disease and providing lasting energy. These fats also help with production of a neurotransmitter, acetylcholine, which improves learning and memory. I add organic raw cacao nibs in this recipe because it is universally recognized now as one of the best superfoods around. Raw cacao contains a significantly higher amount of antioxidants than heated cocoa does. As we know, dark chocolate, in itself, is touted as a good antioxidant source. We know that antioxidants are proven to help our brains function. Raw cacao is rich in flavonoids, substances that have anti-inflammatory and antioxidant effects. Studies show that these substances assist in brain blood flow and optimal oxygen levels as well as promoting nerve function. Raw cacao also contains phenethylamine, which plays a role in increasing focus and alertness. This substance is also shown to improve mental clarity, stamina, energy, motivation and even joy. I, for one, love a joyful child in my house! Coconut oil, too, has properties which promote brain and full-body health. It can decrease inflammation and help destroy harmful bacteria which can affect both our brain and mood. These tasty balls are gluten free, soy free, and suitable for both a vegetarian and vegan diet. Line a baking sheet or tray with wax paper or parchment paper and set aside. In a mixing bowl add: oats, flax seed meal, ground flax seeds, hemp or chia seeds, almond meal, raisins or other dried fruit, and shredded coconut. Stir to combine ingredients well. In a saucepan on low heat melt together: honey or syrup, nut butter, and coconut oil. With a spoon, stir while heating, so it mixes well. Then stir in vanilla extract and salt. Once mixture is melted together, remove from heat. Pour liquid mixture into your bowl over dry ingredients and mix well. It is easiest to mix this all with your hands. Use disposable kitchen gloves if you don’t want your hands messy. Then form into 1.5-inch balls. Set balls on lined baking sheet. Finally, roll each ball in shredded coconut or unsweetened cocoa powder. Place your baking sheet with balls in the refrigerator for an hour or more. This will help them to hold together better before you remove them, stack, and store them all in an airtight container to maintain freshness. Enjoy this grab-and-go snack all week! See more posts from Becca on the Artful Palate blog! Want more ways to boost your kids' brains? Download the Q Wunder app to help them learn social and emotional skills -- and have fun while they're at it! Whether you’re on a road trip, at a restaurant or in line for the merry-go-round, waiting can bring out the cranky in any kid (not to mention their parents). Here are 17 ways to make the waiting game a lot more fun for everyone. How many things can your kids think of that are red? How many kinds of food can they think of? How many red foods? Even kids who complain about school love getting quizzed. Depending on your kids’ ages, you can ask them to name colors, letters or numbers you see on signs or labels, or spell short words and do simple math. This portable game features fun action and question cards to keep your kids busy and entertained. While your kids’ eyes are closed, gather several items from your pockets, purse or surroundings (a coin, mint, sugar packet, lip balm, keys, etc.) on the table or even in your hands. Then take the items away and see how many your kids can remember. Give your kids four letters; they have to come up with a sentence with words that start with each one (TLFC=”Turtles love furry cupcakes!”). Can your kids guess what you’re thinking of? Have them ask you yes or no questions to get closer to the answer, or give them hints to help them along the way. Copy each other’s movements, faces and/or sounds (think dance moves, humming, funny faces, clapping). Keep adding on one more thing until one of you can’t remember what to do next. Find the letters of the alphabet on signs, labels, anything. Tell your kid two things they don’t already know about you and one thing you make up and ask them to guess which one’s the lie. Try pattycake, Miss Mary Mack…or practice doing the Eye Contact Hand Jive from our founder Sofia! In this game, the only rule is for players to keep asking each other questions for as long as possible without ever answering. (“Do you want to play Questions?” “Why are you asking me that?”) You can keep a dialogue via questions going with older kids; with younger kids, any question will do. Try our list of questions (just click on our free printable below, then print) or have your kids make up their own silly versions on the spot. On a road trip – or just a run to the grocery store – challenge your kids to wave hello to people in other cars and see how many waves back they can get. In this twist on Picnic, instead of bringing foods to a picnic, you invite people everyone knows to a party: "I'm having a party, and I'm inviting Ava, Bodhi, and Caleb!" Stuck in line? Pull out the Q Wunder app for a virtual stack of Do Cards that give kids physical challenges (“Hop on one leg 20 times. Now try the other leg 20 times.”) Bonus: Building physical flexibility also encourages emotional flexibility. In the car at night or naptime, ask your kid to close their eyes, breathe in and think about people they know, where they’d like to go, friends and games they play, and what they did today. A little quiet reflection is sometimes all they need to drift off (though humming “Twinkle Twinkle” doesn’t hurt either). Next: Watch kids test their patience with the marshmallow challenge – then let your kids try it themselves at home!